Although I enjoy teaching Art, I sometimes find it difficult to come up with ideas. A friend of mine has agreed to do some art posts for Irish Primary Teacher. She has also set up a Facebook Page – You can like it here. I really loved this lesson when I did it with my senior infants a few years ago. It needs very few materials, which is always good and is relatively easy. This is best done in two blocks so the glue can dry before details are added. Two lessons of approx 20 mins. 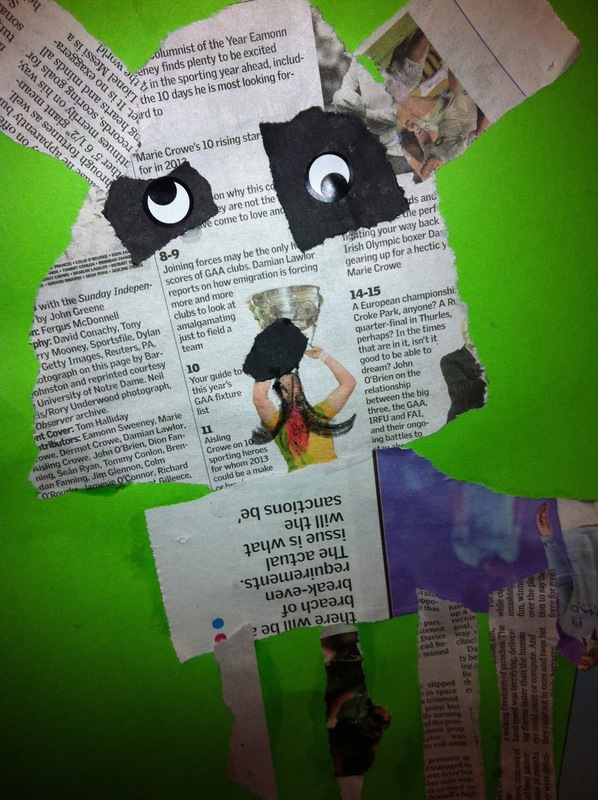 Newspaper torn into small piece 2cm x 2cm / allow children to tear paper into desired shape. First things first, I like to brain storm different ideas with the class on what shapes you would use when drawing a dog. Big round circles, skinny rectangles, or pointy triangles (nice link to math). We decided to do “Dog Portraits”, and so focused on the shape of the dogs head. A more advanced class could do a more detailed picture of the entire dog or even research dog breeds and choose a specific breed. 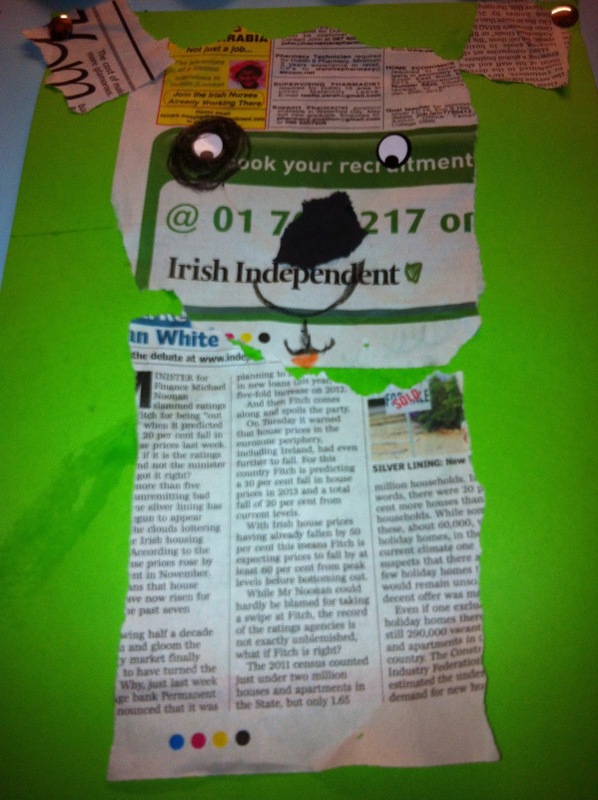 With senior infants I allowed them to tear the newspaper into the shapes they wanted. Otherwise I would encourage them to mark out the shape in newspaper before sticking anything. Some may want to draw the shape and fill it in. 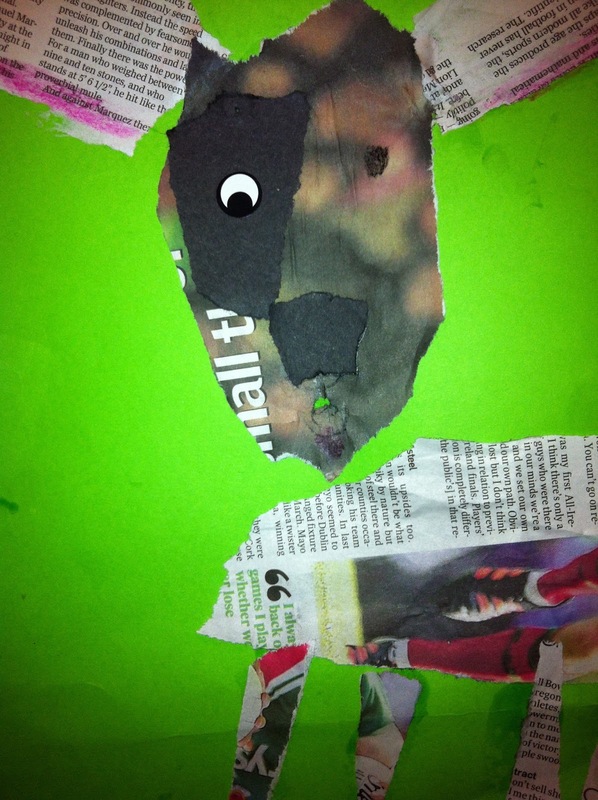 Having decided on the shape of their dog’s head the children can begin to glue down the newspaper. Once the head, ears, and nose have been glued on allow some time to dry. Once dry children can stick on or draw on a collar, eyes and any embellishments.